пробуждения сознания жителей острова, где время остановилось. Пустые улицы, без припаркованных машин выглядят как выцветшие открытки 60-ых. Неужели кто-то готовит эту пищу? Robert Musil’s description of the cognitive process seems especially relevant to the Left’s struggle for a better society. But is the quote’s last half-sentence really true? Do we “know from experience more or less how we should go about” changing society for the better? This question is particularly relevant in reflecting the historical experience of the Soviet Union, a history that leads from triumph to defeat. This process of reflection has been encumbered by party-loyalty: those who dared to place their fingers into the open wounds of Communist history often risked being denounced as traitors by their comrades. To make matters worse, the special emphasis that Soviet Marxists placed on (re)writing the narrative of the Soviet Union’s becoming paradoxically interferes with any attempt to explore and evaluate its actual history. In contemporary Russia, the existent system of power seems totally incapable of formulating or realizing any consistent cultural policy, just it seems unable to formulate any coherent policy on the whole. Nevertheless, it constantly imposes the chimera of the necessity for unity with the state. In order to do so, it continuously promotes and demonizes the image of a certain outer or inner enemy, be it terrorism, orange revolution, or the aggression of U.S. foreign policy, geared toward conquering and dividing our country etc. All of this takes place against the realization  growing more and more massive  that the state is a reality of its own right, alienated from the people, more and more reminiscent of a criminal organization who bosses are interested in nothing but holding on to their present positions, since these position guarantee huge financial profits for catering to someone elses business interests. To this state, the interests of societys development seem like some vexatious misunderstanding, only to be taken into consideration when buying electoral votes in yet another carded election. If one directs ones attention to the fact that a huge, constantly growing percentage of the population either votes against the representatives of power or doesnt vote at all, it becomes completely incomprehensible in whose name this power continues to function. John Holloway /// Can We Change the World Without Taking Power? 1. I don’t know the answer. Perhaps we can change the world without taking power. Perhaps we can not. The starting-point – for all of us, I think – is uncertainty, not knowing, a common search for a way forward. 2. We are searching for a way forward, because it becomes more and more clear that capitalism is a catastrophe for humanity. A radical change in the organisation of society, that is, revolution, is more urgent than ever. And this revolution can only be world revolution if it is to be effective. Alexei: Then politics is a kind of ecstatic frenzy. In kitchen quarrels, people will provoke one another to the point of being beside themselves. This is actually we mean when we talk about kitchen politicians. Artem: Sure. Politics is ec-stasis, literally. It can start in the kitchen, leading from the frying pan to the class struggle. This is what happens when the infinite intervenes, making the parties forget themselves and see what they are fighting for. Oxana: But in politics, people are always divided into two camps. Look at our Left: they are often beside themselves over the pathetic little details of doctrine! 1. In its heterogeneity and permanent movement, Bolivia is at the same time the experience and the fracture of magma. It is there where faces, bodies, and languages tell stories that challenge those seeking to understand, accompany, and enjoy. Our trip, in February 2005, was a struggle between this attempt to understand and the difficulties of adaptation (of which altitude was not the least of obstacles). It is also a wager on the distinctive outlook opened by what took place in recent years in Argentina. And this dialogue between processes of de-institution-construction is vital for both. 2. To arrive in Bolivia is to be surprised at an atmosphere that concentrates an extreme tension between different elements, a polymorphous dynamic that today characterizes, in different ways, the syntaxis of the movements and struggles of a good portion of Latin America. To connect with Bolivia is part of a necessary and renovated literacy. It looks as though any image let itself be seen and read. Today the space referred to as Latin American appears to the public through the emergence of so-called leftist national governments. The literacy we propose is one that allows us to have new keys to read this process. These governmentseach in its own wayfunction as an extension, interpellation, substitution, subordination, displacement and/or reorganization of the movements and experiments that strive, in entire regions of the continentprecisely the hotter and more creative onesto unfold a politics from below. This democratic impulse does not thrive without moments of insurrection, which spatialize and open new terrains, but, evidently, nor does it emphasize the constructive and innovative dimension of the processes that have been opened. Any discussion on Kronstadt today, as 70 years ago, is a historical discussion in the full sense of the word. Neither details nor these or those interpretation of concrete facts are at stake. Instead, the discussion’s central issue is revolution and revolutionary war as such, the significance and the logic of October. The supression of the Kronstadt Uprising has taken a lasting position in the “top ten” moral indictments of Bolshevism, along with the “philosophical steamboat” and the “money of the German general staff”. Both anarchists and liberals find themselves agreeing over this point of accusatory indictment in their critique from both right and left, forming what Trotsky aptly called a “people’s front” of sorts, and calling the validity of the October Revolution into question. For the right, this episode is important because it confirms that the establishing of the “commissars’” totalitarianism had reached its final stage of becoming, stepping into conflict with its recent mainstay, the revolutionary sailors. To anarchists, Kronstadt is a timeless continent drowned in non-being, an “Atlantis” of the democratic socialism of the masses, the revolution’s turning point, after which its fate was already completely pre-determined. 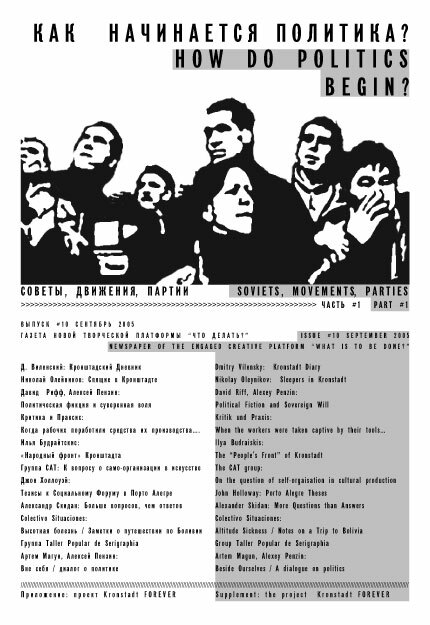 The question is whether there was really any possibility of a historical turn and whether Kronstadt really did offer any political or social alternatives? In recent years, one can observe a deep-seated paradigm shift in the theories of the Left. While many theorists keep their steadfast attention focused on the problem of power, they also see it as something autonomous of its socio-economic base. Moreover, they feel that power cannot be reduced to its traditional representations such as the state or the juridical figure of sovereignty. Instead, it envelops all spheres of life. This, in turn, has spurred a critical re-evaluation of the notion of revolution. As a project centered on government take-overs, the revolution appears as something that loses sight over all the other zones in which power is implemented. Entangled in the mechanism of political sovereignty, it seems doomed to inevitable failure. In search of a way out of this dead-end, the Left abandons the project of revolution altogether or modifies it beyond recognition, orienting itself toward the creation of counter-power through society’s self-organization, which will change the world, not only at some point in the future, but here-and-now as well. This re-invention of a world without power may be appear as a collective fiction, admit its proponents, but active participation will turn today’s fiction into tomorrow’s reality.